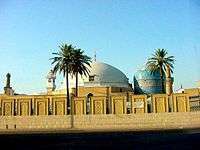 The Gulshani (Turkish: Gülşenî) is a Halvati (Khalwati order) sub-order founded by Pir Ibrahim Gulshani, a Turkmen sufi sheikh from Eastern Anatolia, who died in Egypt. His family roots reaches to Oguzata shah in Azerbaijan. When the Ottomans conquered Egypt the Gulshani order became popular with serving soldiers of the Ottoman army in Egypt. The order was later carried back to Diyarbakir and Istanbul where several zawiyas or tekkes were established. One notable such tekke was that of the ancestor of Şamsettin Efendi, Pir Ikmalettin Efendi in Diyarbakir.